Cold season has hit my house hard this week. Of course, like always I have gotten sicker than everyone else. It probably has a lot to do with the fact that the bus stop for my oldest son is over a block away and I have to wait 10 minutes in the freezing cold every morning and afternoon. If you are wondering why I wait 10 minutes, I tried leaving later a few times and of course the bus was early. So I have a 10 minute span of when the bus 'might' come. Last winter as some of you probably know I was lucky (not) enough to come down with pneumonia and ended up in the hospital. Apparently being very small with a not so fabulous immune system isn't so great as you get older. And by older I mean 30. Ever since I turned 30 it seems my health has taken a nose dive. Low potassium, low iron, gluten intolerance, migraines you name it. So this week I am suffering through a nasty cold with a hyper four-year-old at home and making lots of stew, soup and chili. There is something so comforting about warm foods when you feel not at your best. This week I tried a new recipe for Chicken Brunswick Stew from the January 2013 issue of Family Circle, which looked like perfect comfort food. This recipe has 11 ingredients. It takes 6 hours on high in the Crock-pot, 10 minutes of prep and makes 6 servings. I actually had a hard time finding canned butter beans in my area. I had to go to multiple stores to find the beans since they seem to be scarce in my city. As I always do I used a crock-pot liner instead of spraying cooking spray in the slow cooker bowl. I find the liners to be much easier to use and make a lot less dishes to wash. Make sure to add additional salt before serving. Since the recipe utilizes potatoes it needs a decent amount of salt to have flavor. I followed the remainder of the recipe as written. My husband was very impressed with this recipe. It turned out very tender and the chicken literally fell off the bone before being shredded. I really don't serve okra often, since it can become slimy when cooked. However, the okra in this recipe was cooked perfectly and delicious. 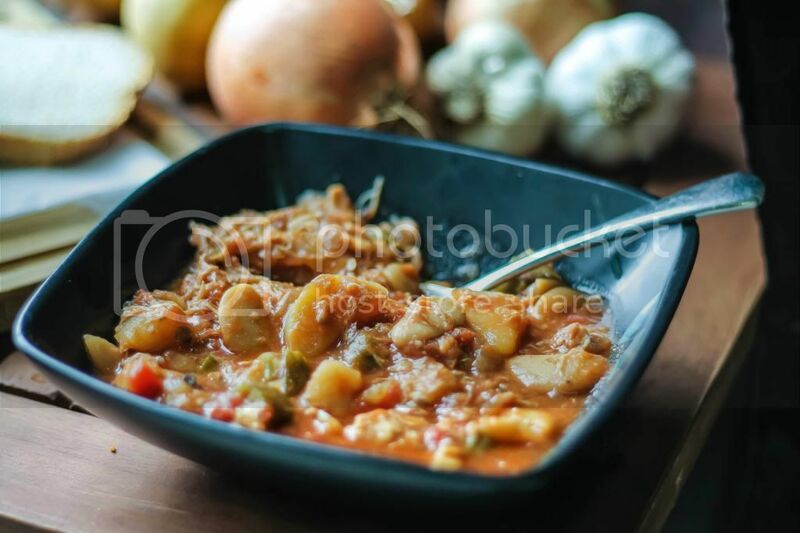 Brunswick stew is one of my husband's favorite dishes and this recipe was definitely a hit. For the recipe go to Chicken Brunswick Stew. I hope you feel better! Being sick before Christmas is no fun! I am feeling much better today, thanks :) I agree it's no fun being sick during the holiday season! Looks delicious! Perfect meal when fighting a cold. Get well. Thanks :) I love stews and soups when I'm sick, they are so comforting!